Eugene A. 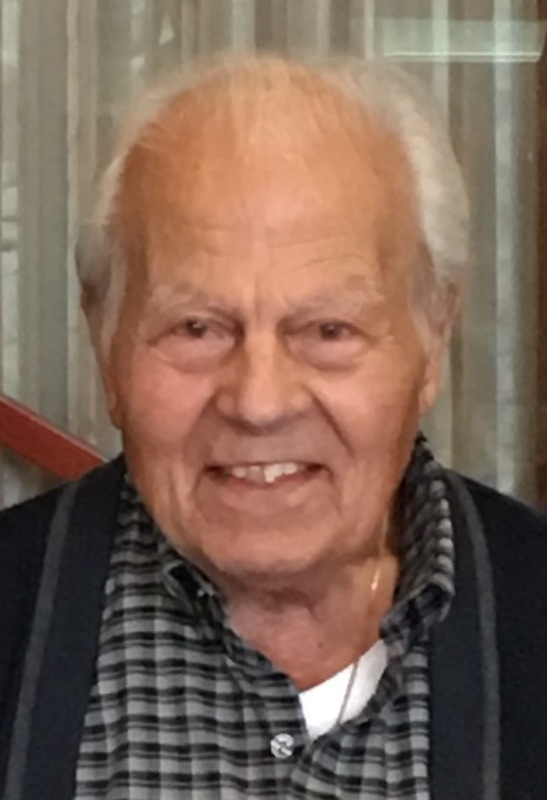 "Gene" Gigliotti, 92, of 10 Chamberlain Avenue, Bradford, passed away Thursday, March 21, 2019, at Bradford Manor. Born October 1, 1926 in Bradford, he was a son of the late Joseph G. and Elizabeth (Falsatta) Gigliotti. He was a 2002 honorary graduate of Bradford High School as part of the operation recognition for those veterans who left school early to secure our nations freedom. Gene was employed as a Professional Fire Fighter for the City of Bradford from August 12,1952 to October 1, 1976. In addition to his full-time employment Gene started the first air freight delivery service from the Bradford Regional Airport in 1960. He also owned and operated Crystal Coil & Bar Supply and along with his son Tim he owned and operated Bradford Air Cargo & Dedicated Delivery Service. Gene was a lifetime member of St. Bernard Church, VFW Post 212 and American Legion. Mr. Gigliotti is survived by his son, Timothy Gigliotti (Robert Pascarella), of Bradford, one brother, George Gigliotti, of Bradford, Gene's companion of many years Debbie Patrick and her son Cody Minich of Bradford, several nieces and nephews. He was preceded in death by his parents, his former wife Alice (Collins) Gigliotti, one sister Ida Rose Gigliotti, two brothers Joseph Gigliotti and Patrick Gigliotti. Family will receive friends on Tuesday, March 26, 2019, from 5;00 pm to 7:00 pm in the Hollenbeck-Cahill Funeral Homes, Inc. 372 East Main St., and again from 9:30 AM to 10:30 AM on Wednesday, at 10:30am a Prayer Service will be held followed by a Mass of Christian Burial at 11:00 AM in St. Bernard Church, with Rev. Raymond Gramata, pastor as Celebrant. After the Mass committal services and Full Military Honors by members of the United States Army, and members of the Honor Guard of the Bradford American Legion Post 108 will be conducted in St. Bernard Mausoleum, with entombment to follow. Memorials contributions if desired, may be made to the charity of the donor's choice. Such a good friend of Tony. They had many fun times together. So sorry for your loss. I am out of town so won''t be able to be at the service but sending my condolences. I''m sorry to hear about your loss Tim! Your dad was one my favorites growing up! Dear Tim, So sorry to read of your dad''s passing. Thinking of you at this time. Tim & Bob ... Sendong our heartfelt love, prayers, and sympathy to you both during the loss of your Precious Geno. We will forever remember his smiling face, and fun-loving nature! Knowing he will always be smiling down on you! From your good friend of 59 years, our parents and both of us have many great memories. Remember those days. Dear Tim, as you no doubt remember, during Jr. High, I think I spent more time with your family and at your house than I did my own. I have many fond memories of times out on the boat with you and your dad (not to mention the lonnnngg road trip to Goshen, IN to get that boat). I hope you find some peace, solace, and rest during this difficult time. My thoughts and prayers are with you my longtime friend. You a one in a million! You will be missed but I am so happy to have served you. You are a joy and I am sure the heavens have welcomed you with open arms. I was sad I didn''t see you but I know it wasn''t in the Lord''s plan. Many prayers for the pain but many smiles for your memories so blessed.